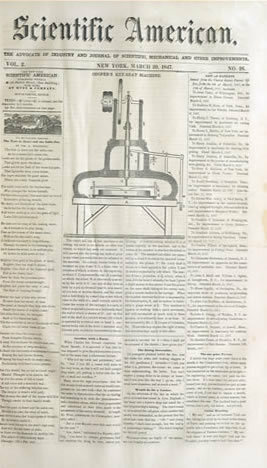 Subtitled the "Advocate of Industry and Journal of Scientific, Mechanical and Other Improvements," Scientific American begin publication in 1844 as a magazine devoted to "scientific" content as opposed to a general magazine that covered the arts, politics, literature, science, and broad interest topics. However, it reads much like any popular magazine of the era, with full articles and annotated lists of new patents interspersed with one-sentence fillers, humorous anecdotes, doggerel, and new business news. The articles were generally unsigned; the "Letters" were reports from readers, sometimes signed with actual names, but often with only initials or titles. The subscription guaranteed from "three to six original engravings," indicating both the need for illustrations of new scientific developments and the quality of the publication. Scientific American eventually became a quality publication for the lay reader, not the "trade," a magazine you sent as a birthday present to your technically minded grandchild.